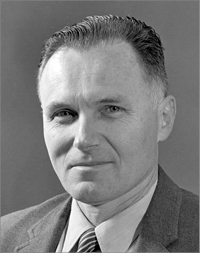 Robert B. Leighton was Emeritus Professor of Physics at the California Institute of Technology (1947-1997). His research interests included the electromagnetic spectrum and telescopes. September 10, 1919Birth, Detroit (Mich.). 1941Obtained BS, California Institute of Technology, Pasadena (Calif.). 1943 – 1945Researcher, California Institute of Technology. 1944Obtained MS, California Institute of Technology, Pasadena (Calif.). 1947Obtained PhD in Physics, California Institute of Technology, Pasadena (Calif.). 1947 – 1997Research Fellow (1947-1949); Assistant Professor to Professor of Physics (1949-1985); William L. Valentine Professor of Physics (1985-1986); and Emeritus Professor of Physics (1986-1997), California Institute of Physics, Pasadena (Calif.). March 9, 1997Death, Pasadena (Calif.). PhD advisor at California Institute of Technology, "The vibrational spectrum of a mon-atomic face-centered cubic crystal lattice," and both employed at California Institute of Technology. Advised by Leighton at California Institute of Technology, "Observations of oscillatory motions in the solar atmosphere." Obtained BS (1941), MS (1944), and PhD in Physics (1947). Researcher; Research Fellow; Assistant Professor to Professor of Physics; William L. Valentine Professor of Physics; and Emeritus Professor of Physics. Joint ceremonial session of the American Physical Society and the American Association of Physics Teachers [sound recording], 1972 February 1. Oral history interview with Robert Benjamin Leighton, 1977 July 29 and August 5. Robert B. Leighton papers, 1938-1988 (bulk 1961-1988). Oral History interview with Donald E. Osterbrock, 2003 February 10. Oral history interview with Robert W. Noyes, 2007 December 5. Exercises in introductory physics [by] R.B. Leighton [and] R.E. Vogt. Six easy pieces: essentials of physics, explained by its most brilliant teacher / Richard P. Feynman; originally prepared for publication by Robert B. Leighton and Matthew Sands; new introduction by Paul Davies. The Feynman lectures on physics / [by] Richard P. Feynman, Robert B. Leighton [and] Matthew Sands. Robert Benjamin Leighton Physics Today obituary. Robert Leighton California Institute of Technology obituary. Robert Leighton New York Times obituary.